Easy garlic mashed cauliflower is a simple side dish that is ready in just 15 minutes and is the perfect compliment to just about any meal! These garlic mashed cauliflower side dish is vegan, gluten free, grain free, paleo, and Whole30 approved. Also it’s familiar enough that you might even be able to get your picky toddler or spouse to enjoy their veggies without too much effort! Mashed cauliflower, have you tried it yet? It’s been a staple at my house for years, after discovering how simple and easy it is to make! I have a tip to help make this side dish even more nourishing, adding hemp hearts will add protein, some healthy fats, Omega-3s and a nice nutty flavor. It reminds me of adding Parmesan cheese to mashed potatoes, you know that extra special step that turns a normal weeknight meal into something a little more special. 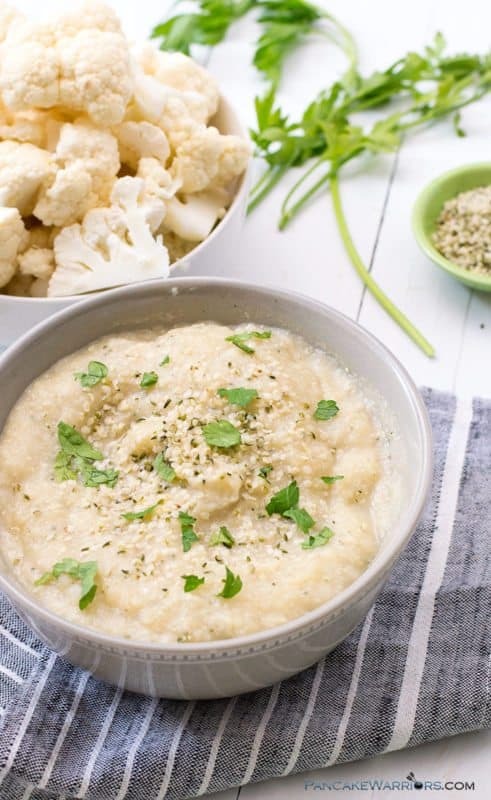 This simple vegan garlic mashed cauliflower dish only has 5 ingredients: cauliflower, organic vegetable broth, hemp hearts, a touch of salt and garlic powder. Talk about simple! You don’t even have to peel garlic for this easy dish! And garlic mashed cauliflower is the perfect lower carb solution to your mashed potato cravings. You could also do half cauliflower and half white potatoes to cut the carbs in your mashed potatoes! I personally can’t get enough cauliflower. I’m the girl that buys all the riced cauliflower at Trader Joe’s and will happily eat cauliflower for breakfast, lunch and dinner! Don’t believe me, check out this recipe for apple cinnamon cauliflower oats that will change your mind on cauliflower for breakfast! And of course using riced cauliflower in burrito bowls or in my famous low carb cauliflower lasagna. If you haven’t tried that recipe, you need to! It’s another classic dish made a little healthier with my favorite vegetable cauliflower! Did you know that cauliflower is full of a compound called glucosinolates which help activate the body’s detoxification system? It’s actually what gives cauliflower it’s distinct smell when cooking. This compound is broken down into it’s active form during chewing in the mouth. Cauliflower is also a great source of potassium which is the same electrolyte in your sports drink, making cauliflower the perfect post exercise food! 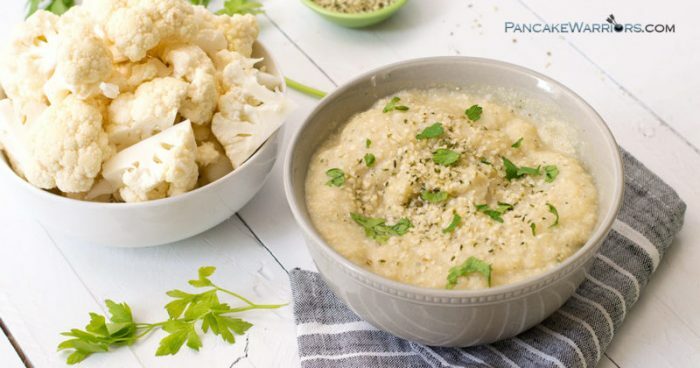 One cup of raw cauliflower has about 75% of the potassium as a medium banana, so it’s a great low carb way to get your potassium in! Feel a cold coming on? Eat your cauliflower! Cauliflower is a great source of Vitamin C, providing over half the recommended daily amount of vitamin C in just one cup of raw cauliflower. Cauliflower is also packed with fiber, helping aid in digestion. 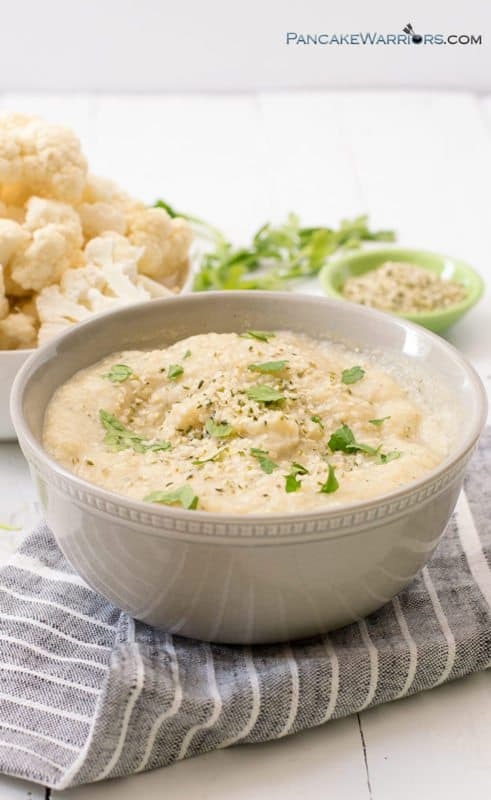 Did you know that the compounds in cauliflower also helps protect the stomach lining and helps resist the growth of certain bacteria in the stomach? Easy garlic mashed cauliflower is a simple, no fuss side dish ready in under 15 minutes using just 5 ingredients. Gluten free, grain free, vegan, paleo and whole30 approved. Remove the cauliflower florets from the stalk and chop so that all the florets are about the same size. Don't worry about how they look, you will be mashing the cauliflower. Add the florets to a medium pot, and add 3/4 cup organic vegetable broth. Place over medium high heat and cover tightly. Cook the cauliflower about 13 minutes until fork tender. Don't drain the cauliflower. 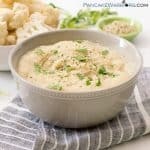 Blend the cauliflower with an immersion blender or in a high speed blender (carefully, it's hot). Add the hemp hearts, salt and garlic powder and blend well to combine. Serve hot and top with additional optional hemp hearts. So tell me what is your favorite way to eat cauliflower? You might also find this article on the health benefits of cauliflower helpful.